I'm trying to mount the libreelec storage partition of an SD card built with a fresh dual boot install of raspbian + libreelec on a 128GB Sandisk CD card built with NOOBS. I'm using a Raspberry Pi 3 Model B. Both OSs work fine on the pi so it looks like the install was successful. The only issue is that when I put the CD card into a laptop running Ubuntu 16.04, Gparted is unable to mount the Libreelec partitions. This is an issue as I would like to load it with some videos for local viewing from the SD. That's why I used such a large card. When Libreelec is running I can sftp into it and load the files that way but its very slow. As soon as I start Gparted it reports the error that the partitions have been written but the kernel can't be informed "probably because it/they are in use". The SD card partitions look as though they are created correctly and both OSs work on the pi but for some reason partition 8 & 9 don't mount. And partition 9 says similar but for the e2fsprogs package but dosfstools, mtools and e2fsprogs are all installed. Parition 8 will be the libreelec boot partition and partition 9 the storage partition ie the one I'm looking to mount. I guess its something to do with the large number of extended/logical partitions or maybe something to do with shrinkfs. 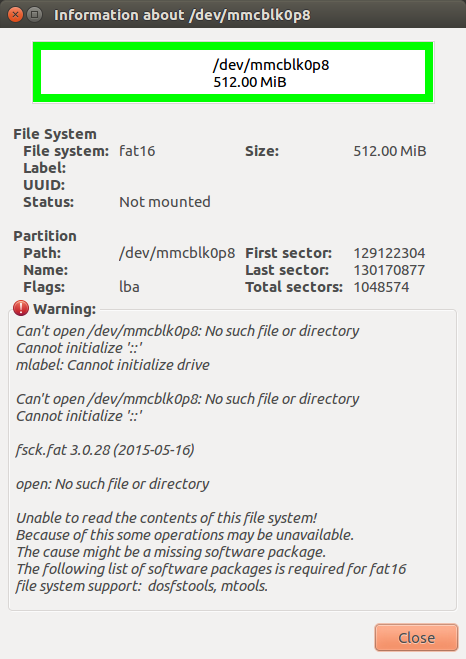 Do you have any ideas how I can mount Libreelec's storage partition? I found a work around for this mounting the sector directly bypassing the partition table. It's not ideal but it works. This replaces the Risc OS boot sector with zeros so the kernel should no longer get confused. gparted now no longer reports an error when the card is put in but the partitions still won't mount through the GUI. Which suggests the kernel still isn't happy with the resultant SD card or perhaps something is wrong with the partition table. I tried recreating it in gparted with the same result. /dev/mmcblk0p1: LABEL="RECOVERY" UUID="55E5-68DB" TYPE="vfat" PARTUUID="5d3458e6-01"
/dev/mmcblk0p5: LABEL="SETTINGS" UUID="b7695dd5-a218-410f-bc1e-2b69bb370e55" TYPE="ext4" PARTUUID="5d3458e6-05"
/dev/mmcblk0p6: SEC_TYPE="msdos" LABEL="boot" UUID="6D9B-18FD" TYPE="vfat" PARTUUID="5d3458e6-06"
/dev/mmcblk0p7: LABEL="root" UUID="294e63b6-0052-432e-8dfa-878df194322d" TYPE="ext4" PARTUUID="5d3458e6-07"
Which mount it as root! That means I can copy the files at least with a root launched nautilus. Not great (and not "just works") but I'll use that for now. Incidentally sudo umount /media/ian/libreelecboot doesn't work - it's always busy even if I've closed down all processes that can access it. Again, not great but there we are. Not the answer you're looking for? Browse other questions tagged raspbian noobs openelec or ask your own question.